This article is a mirrored version of that at http://www.qsl.net/vk2dym/radio/collection.htm. It is presented here for posterity and to honour Colin MacKinnon (1941-2004) and his devotion to the 'cause' of radio preservation. It also is meant to serve as a salutary warning of the 'danger' of uncontrolled hoarding! SAD TO SAY, MY RADIO COLLECTION IS IN HERE. I had an interest in wireless from an early age, but lived in the country, so I did not have much contact with military radio. However, when I moved to Sydney I met Ian O'Toole, VK2ZIO, who deserves to get the blame for leading me down the path to depravity and dysfunction. Ian introduced me to the wonderful world of surplus shops, as he knew them all, whereas I was just an innocent yokel from the bush. At the time, surplus equipment was being trashed or broken up by old timers and the surplus dealers, and it seemed such a shame that all this WW2 history was being scrapped and dumped - so I rescued a few radio bits. Then a few more radios needed to be saved and...well, you get the gist. Many's the time Ian and I would venture forth and attack the piles of "good stuff", coming home with a station wagon loaded down 'till it was dragging its back bumper on the ground. I told my little lady I was minding stuff for Ian, and he told his wife, Pat, the same story, holding stuff for me. Boy, were we in trouble when the women got together and compared notes! Before too long, my car wouldn't fit in the garage. Then HER car wouldn't fit in the garage and I can tell you, from experience, that does not bode well for personal relationships. So I bought a large garden shed but it quickly filled and I needed another one, plus under the house was packed (with great difficulty, I might add - ever tried crawling under a house lugging an ART-13?) Inside the house was more or less off limits because the better half is a mean woman, real mean, with no understanding at all. I was forced to bring stuff in and hide it in the house when she was out shopping. Eventually the little woman decided we HAD to move - something about the house falling down round her ears because I was too busy collecting junk to do any work around the place. Now, that's when the fun started. How was I going to move my treasured collection? I'd lost count of how many radios I had after reaching 800 plus. The logical solution was to obtain a 20' shipping container - cost $1500. That one quickly filled so I bought another ($1600) and it too was chocka within a week or so of moving and packing my stuff. Now when you buy a container it weighs maybe 3 or 4 tonnes and they just slide it off the back of a tilt- tray truck. BUT, when you fill it with radios and ask them to lift it again when it weighs "Oh - I reckon 8 tonnes or so", it's a different matter. The tilt-tray truckies all ran for cover. I contacted all manner of transport and shipping companies. By now the deadline was looming for us to move out and I was getting nowhere. The ever helpful missus came up with a suggestion involving dynamite. We couldn't get a side loader truck in because there was not enough clearance down beside the containers. I even found a little guy who had 4 hydraulic lifts which lift each corner of a container to allow a truck underneath. Problem was the jacks are very heavy and need solid concrete to roll on and I just had dirt and grass. Well, we moved house but the containers were still back at the old place and I had to ask permission from the new owners to leave them there 'till I could arrange transport. They reckon the 3 most stressful things in a person's life are a death in the family, your divorce and moving house. Let me tell you, moving containers full of radios qualifies right up there. Eventually I found a company that had a 12 tonne tilt-tray truck - I was saved!! It would only cost me $250 per trip, $500 all up. It turned up as arranged and it was a beauty. A monster Mercedes with dual 4 wheel bogies at the back and dual steerable wheels at the front and it looked the goods. The driver was a young bloke who admitted he hadn't lifted anything real heavy with this truck before, but "she'll be right, mate." Well he tilted the tray and started dragging a container with a steel cable winch. About 1/3 of the way up the front wheels of the truck suddenly lifted 1.5 metres off the ground! With suitable unmentionable exclamations from both of us, the driver thought he'd better ring his boss on his mobile phone. Boss said, "Don't be a wuss! Just drag it up!" And so he did, with the hydraulics of the truck on overload and popping the safety valve between groans and screeches as the winch dragged the container up the tray. At last the front of the truck dropped back to earth, and the container was safely in place. The driver started off, very slowly out the drive and up the hill, on the way to our new house. I watched with a sigh of relief. Then about 100 metres up the road there was one almighty BANG and the truck stopped dead, then started to roll back with smoke pouring from the brakes as he tried to hold it from running back downhill. Eventually he stopped it against the gutter but it wasn't very secure. Every couple of minutes the truck would lurch back an inch or so with a great screech from the brakes and a belch of smoke from each brake drum and it looked like it could run back any minute straight into my house - well, the new owners' house. Thankfully it eventually stopped in one spot. The drive-shaft coupling, which was about 100mm diameter, had snapped, leaving the thing with no motive power. Now the driver reached for his mobile phone again but instead of ringing his boss he rang his wife to tell her to get in to the office quickly, to pick up his pay before the boss found out what he'd done! In the meantime I'm having a panic attack. When his wife rang back to say the wages had been collected the driver rang his boss who seemed less than pleased, by the strength of the language we could all hear over the phone. The upshot of numerous phone calls was that a new coupling would cost $1000+, had to be shipped from interstate and the truck couldn't be repaired for a day or so. The driver's wife turned up and he said "I'm off" and shot through, never to be seen again. Now what was I to do? After a bit of fast thinking, many phone calls and lots of nail biting I found a friendly mobile crane company and was told that although they'd knocked off for the day they could help, on overtime rates. With no choice I said come on over! I should explain that we lived at the end of a loop road and the broken truck was half blocking the road, restricting access both ways. But things were about to get worse. In due course, a 60-tonne mobile crane arrived, and if you've never seen a 60-tonne mobile crane - it is BIG! It had signs front and rear warning traffic that it was "Oversize", and they weren't kidding! Not only that, but it came with another truck to carry the slings and hooks and two riggers, plus two 40-foot semi-trailer trucks (for the containers), plus a Heavy Lift tow-truck turned up to take away the Mercedes. By now the neighbours were hanging from every window, watching and wondering what the madman (me) was up to now. They set up the crane, totally blocking the road, and started to lift the container off the Mercedes. "Geez, mate, no wonder you broke it! This container weighs 22 Tonnes!" The crane had a weigh scale so the driver was able to give me this wonderful news. Thankfully, the crane made short work of placing the container on a truck. At about this time in the afternoon, the school bus came rumbling round the corner to be confronted by a blocked road with trucks and rubber-neckers everywhere. After some coarse words he got the obvious message that he'd have to back up and go round the other way. So he backed up into my next door neighbour's new gravel driveway and got the bus bogged! Thank God they weren't home as they were funny people who would not have been amused. So we diverted "the Big tow truck" to drag the bus out and send him on his way, shouting profanities as he went. Now the crane lifted the second container and it only weighed 20 Tonnes. Minus the container weights, I now knew I was the proud owner of around 42 Tonnes of radios. But things were looking good, the containers were on trucks, the road was clear and the kiddies were home safely. Actually they were all out the front with their mummies and daddies, watching the fun. However, now the crane driver casually mentioned that because of the size and weight of his crane it couldn't legally go on any of the roads to our new place and he had to get council or police permits to travel anyway. After further "discussion" we decided that I may as well be hung for a sheep as a lamb (that's an Australian expression meaning I was up to my ears in sh*t anyway) and if we got caught I'd take the blame. So we headed off, with me leading a procession of big and long vehicles around the back roads, to avoid any possible hassles from being on the main roads. The crane driver did suggest we should not go over any bridge along the way as none would stand the weight of his crane. Despite the grim outlook we arrived safely under cover of darkness but now we had to block the road again to get the trucks to back through our narrow gate. This entailed people with flash lights located up and down the road to stop traffic and act very important. One helper told everyone he stopped it was a police operation to bust a drug baron - I'm still explaining that to the neighbours. The crane set up down the back yard and we set up floodlights so they could see what they were doing. Lord knows what the neighbours thought of the new arrivals. Everything was going smoothly if noisily when another problem arose. My better half, who is a nurse, now decided to freak out and have a ranting and raving and screaming attack. When I got her calmed down and asked what's wrong she said she was worried that if a container fell on anyone she wasn't sure she could render first aid because she was so upset. I explained that if a 20 Tonne container did fall on anyone we wouldn't need first aid, we could just roll him up, take him home and slide him under the front door. In due course the containers were dropped off and it came time to settle up. The two truckies had their hands out and the crane crew had a very official looking rates and overtime book. One of the riggers came in with the driver, just to lend moral support I guess. He was a very large and well fed Maori, complete with full face and body tattoos and no teeth which he explained he'd lost from fighting in pubs. I believed him and wasn't going to haggle over the price was I? The driver licked his pencil (always a bad sign) and started writing up the job sheet. The damage was $2400 for the crane and $500 for each of the truckies. One truckie even gave me his card in case I wanted to move anything else - fat chance, I'm never going to move again. The one bit of good news was that I never heard from the company with the broken tilt tray truck. So now you know why the photo at the top has such poignant significance to me. That's where my suddenly very expensive radio collection resides. 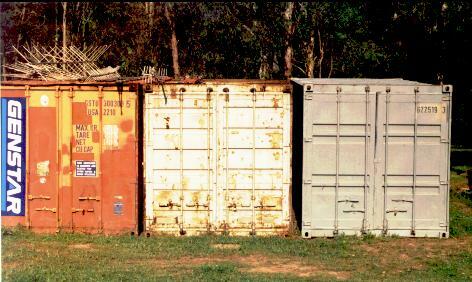 Ah, the third container in the photo? Well I needed it soon after for the additional stuff that seems to keep following me home. And what you don't see is a caravan that is sinking into the ground under the weight of the overflow of more essential military radios. Oh and a stable that is full of radios, not horses. And what of Ian? He built a dedicated museum building for his collection but you can't get into it now because it's overgrown with radios. It's even difficult stepping over stuff on the veranda to get into the back door of his house. Please note, this article is copyrighted and the writer is certifiable.